Canadian Flood Underwriter - Can Fire Underwriters Survey History Guide Urban Flood Risk Management Model? Can the history of the Fire Underwriter Survey provide a roadmap to a future Canadian flood underwriting model? Fire Underwriters Survey (FUS) is a national organization and was formerly the Insurers’ Advisory Organization (IAO) and Canadian Underwriters Association. As noted on their site, "FUS provides data on public fire protection for fire insurance statistical work and underwriting purposes of subscribing insurance companies. Subscribers of Fire Underwriters Survey represent approximately 85 percent of the private sector property and casualty insurers in Canada." "The Underwriters, the history of the Insurers' Advisory Organization and its predecessors, the Canadian Fire Underwriters' Association and the Canadian Underwriters' Association," by Christopher L. Hives, 1985. If "flood is the new fire" as far as Canadian insurance losses go (Fort McMurray 2016 notwithstanding), much can be learned in how the insurance industry developed the Fire Underwriters organization to organize, guide, educate, and support member insurance companies. How did fire insurance evolve? The first fire policy was written by the Phoenix Company in 1782 policy in Sr. John's, Newfoundland and the first Canadian company to offer fire insurance was the Nova Scotia Fire Insurance Association, founded in 1809 in Halifax. More players joined and by the mid 1800's it was apparent there was a need for standardization and organization - so in 1857 "in order to better serve the interests of the community and the participating companies, a joint body or association called the Halifax Insurance Board (was) formed". Following a 1859 severe fire in downtown Halifax with payouts of £128,075 the board commented on causes and identified "the want of sufficient supply of water at the commencement and to a general want of management". It made recommendations for an improved city water supply for the city, more firemen, and water supply infrastructure along Barrack Street with branch lines exclusively for fires. Without these risk reduction measures, the board would increase tariffs (i.e., premiums). The early Halifax example illustrates the partnership between government and insurance industry whereby standards for municipal services consider insurance industry needs, which it could be argued, mirror the financial needs of the economy, and the government's need to promote safety and security in the community as a whole. Over the next century or so, a national organization was formed, evolved and grew (Canadian Underwriter's Association (CUA) founded in the late 1880's, and Insurer's Advisory Organization (IAO) in the 1970's incorporating CUA and independent members). In the late 1970s, lAO developed one of its first computer applications to determine whether a sprinkler system would function properly and if the water supply was sufficient. This replaced inefficient manual calculations. One could draw parallels between the IAO's analysis of sprinkler fire suppression systems and the assessed benefits of flood prevention systems. In the case of large watersheds in the Toronto area, prevention features would include infrastructure such as the Lower Donlands Landform Berm, Black Creek Channel, and TRCA dams - all incorporated in JBA's flood defense layers. At the local municipal level, flood prevention features would include drainage and municipal infrastructure standards incorporated in new resilient communities, or upgrades for flood risk mitigation in communities build with lower standards (e.g., pre-1980's subdivisions with limited overland drainage design, and partially-separated wastewater systems). Currently CGI Risk Management Services conducts Fire Underwriters Survey (FUS) services for the Canadian insurance industry, including assessment of municipal water supply systems including adequacy of available flow rates for structures in the community, and distribution system adequacy and reliability. This information helps guide community improvements and to establish "municipal gradings for insurance purposes", according to CGI. 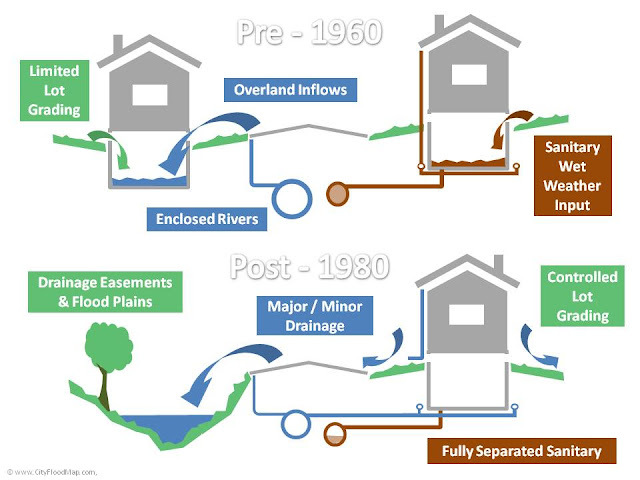 The parallel in the context of urban flood risk assessment would be i) assessment of wastewater systems to safety convey extraneous flows during extreme wet weather events, without surcharging and causing floor drain sewer back-up, and ii) assessment of overland drainage systems to safely convey overland runoff ('major drainage system flows) to an adequate outlet like a channel or valley, without surrounding and entering buildings. Since the 1970's, computer assessments of wastewater system capacity has been pursued using the SWMM model, typically in the context of flood remediation or CSO reduction studies. Today, such models are more widely available, but even in jurisdictions like Toronto, they are only now being developed to cover the entire municipality and to be developed with robust standards. Over time, the risk characterization from such models could be used to establish a municipal grading for insurance purposes, likely at a block face level of detail. Overland flood risk models are only now becoming commonplace, including JBA's riverine and surface (pluvial) flood risk models based on 2D overland flow modelling. The difference between CGI's fire risk assessments and flood risk assessments is that no flood risk assessments are tied to 'municipal gradings'. Municipal wastewater system assessments can result in infrastructure improvements, or when not cost effective, deferred projects. But neither condition is communicated to an insurance risk body, and the insurance industry is not known to participate as a stakeholder in the municipal environmental assessment studies that guide the improvement strategies. Similarly, the overland risk assessment available to those writing individual policies are not shared with municipalities to guide macro-scale, neighbourhood-level improvements to infrastructure that could mitigate risks and premiums. IBC's Municipal Risk Assessment Tool (MRAT) estimates municipal wastewater back-up risks but these are not used to set premium rates or identify specific municipal infrastructure improvements (i.e., MRAT provides generalized, regression-based "high-low" risk mapping for one type of flood risk but does not incorporate system hydraulics to assess upgrades, nor does it assess neighbourhood overland flood risks or remediations). Given that fire insurance and underwriting support evolved over more than 200 years, and that technical assessments of some risk factors like fire suppression sprinklers emerged only 40 years ago, flood risk underwriting likely has decades to go before an effective partnership can develop between the insurance industry and municipalities and other levels of government. the planners and the managers of change. With the continued support of its Members, lAO would like to be counted among the latter." Ted Belton's comments on the status ofthe industry at the end of 1980, following all time high 1980/1981 loss ratios. Given current flood loss trends, Mr. Belton could have been looking out 35 years to today when investment earnings are low (again) in this low interest environment, and when extreme rainfall losses are on the rise. Imaginative change is again needed to develop a flood underwriting strategy. Premier snubs Ontario Society of Professional Engineers with form letter - OPSE says "missed the intent"
So sad for Ontario. Premier sends a form letter in response to OPSE letter on climate and energy policy and the Ontario Action Plan on Climate Change. "OPSE wants a response from you that acknowledges the importance of engineering expertise and commits to consulting with OPSE and Ontario's engineers, now and in the future." OPSE suggests the Premier missed the intent of the communications, but it is likely that the Premier just does not care. "Ontario Premier Kathleen Wynne is behaving like an environmental activist unburdened by accountability, rather than a government leader devoted to protecting the welfare of her constituents." Obviously the Premier believes that the engineering profession would be a burden and bring unnecessary accountability to Ontario's environmental and energy sectors. Ontario engineers “fed up” with province ignoring them, expose "a lack of meaningful consultation and expert analysis in planning"
The Ontario government has avoided a data-driven, evidence-based approach to managing extreme weather damages due to urban flooding. CityFloodMap.Com readers will know that Ontario's Cap and Trade climate change action plan is a mitigation strategy that ignores fundamental engineering facts, and quantifiable causes of flooding, explained by the sciences of hydrology and hydraulics, as opposed to meteorology. Now the Ontario Society of Professional Engineers (OPSE) has openly criticized the Ontario government for its a "lack of meaningful consultation and expert analysis in planning". The OPSE full letter is provided below. In the coming days your government is scheduled to release Ontario’s official Climate Change Action Plan, a document that will lay out the provincial strategy to combat climate change, anchored by the newly legislated cap-and-trade system. Ahead of the official Action Plan, the Globe and Mail published leaked cabinet-confidential draft documents detailing the planned phase out of residential natural gas, among other things. While concern and speculation regarding the future of natural gas has captured public and media attention, the Ontario Society of Professional Engineers (OSPE) remains resolute in driving attention to the larger issue afflicting Ontario’s public policy processes: a lack of meaningful consultation and expert analysis in planning. Matters of complex science, functionality, and design are areas that demand the expertise of engineers to inform public policy decision-making. Sadly, the engineering community does not yet have an effective seat at the policy table. Often, by the time engineers are involved, highlevel planning decisions have already been made by non-technical persons. These individuals are often unaware of the engineering ramifications of their choices. This approach gravely limits policy discussions on more cost-effective options and diminishes Ontario’s ability to deliver the best-possible solutions to tackle its most complex problems. In terms of its significance, complexity, and size, combatting climate change is arguably the greatest global challenge in human history. As such, establishing Ontario’s cap-and-trade system is a significant and bold undertaking that demands expertise, meaning the consultation of engineers is necessary throughout the conceptualization and implementation phases. Addressing climate change will demand technological advancement and innovation—and engineers are aware of the current state of technology solutions and the timeframes to commercialize new innovations to meet our ambitious targets. Simply put: engineers understand not only how things work, but also how things work together; for today and tomorrow. As your government looks to establish a complex framework involving markets and allowances, incentives and compliance tools, and timeframes and technology, the engineering community is a natural ally that is accustomed to total lifecycle costing, complex analysis, and fully developed simulation studies to achieve desired outcomes. The way to forecast and realize outcomes is to conduct detailed technical and economic analyses combined with appropriate simulation studies. Whether the province is planning to build a new road or develop a community health program, it makes sense to collect data, develop models, run trials or simulation studies, and consult with experts to establish a plan. When we consider the issue of climate change, a challenge known for its massive scale, complexity, and impact, it is only logical that the province invest resources to fully understand the problem and design a costed and comprehensive plan before taking action. Given the overall importance of this plan for Ontario’s future, it is critical that government engage engineering specialists in their existing organizations (i.e. Ministries and Agencies) and as thirdparty advisors and reviewers to ensure proposed policies are robust, optimized, and affordable. Only once this has been accomplished is it reasonable for government to proceed – not before. We have seen how failing to engage with Ontario’s engineering community to formulate Ontario’s green energy policy and implementation plans led to undesirable and costly outcomes. Ontario’s 2009 Green Energy Act stands as a clear example of this problem and its consequences. Ontario’s electrical grid was originally designed to operate at minimum cost. Consequently, the Ontario grid contains inflexible base-load generation with minimal amounts of energy storage. The large amount of intermittent generation added to the grid after 2009 has precipitated over-capacity situations, and this problem gets worse as more intermittent generation is added. This energy cannot be economically stored using present storage technologies, meaning it must be curtailed—essentially wasted— and sold significantly below its total cost of production to neighbouring jurisdictions. This has contributed to a rapid rise in Ontario’s electricity rates. 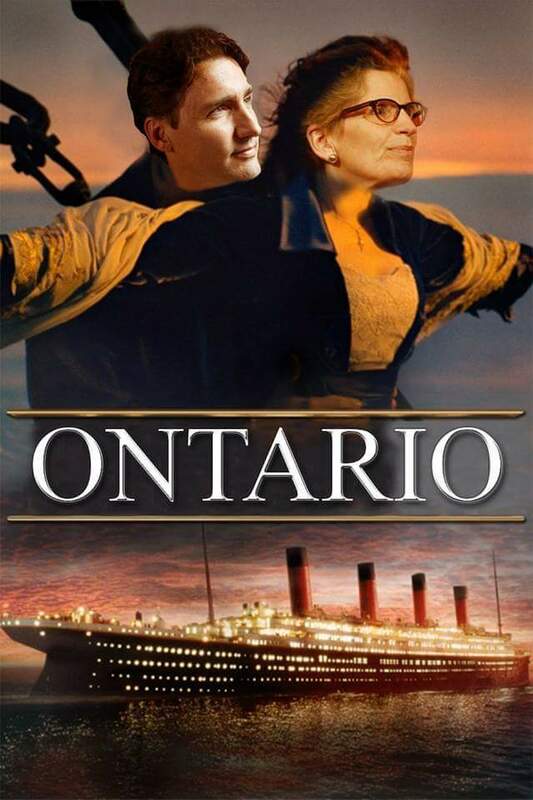 Ontario is contractually obligated to continue existing power purchase agreements, and breaking these agreements would bankrupt wind and solar power companies, at the same time destroying confidence in the government. However, we can and must learn from experience. All power generation needs to be part of a well thought-out supply mix that respects production and demand characteristics and takes into consideration the cost of each generation technology. The shortcomings of policy decisions in Ontario’s Green Energy Act underscore the need for engineers to be engaged to perform pro-forma engineering and cost analyses and simulation studies on various options as part of the policy making process. This will help to ensure our environmental goals are achieved at an affordable cost. While Ontario’s Green Energy Act resulted in an 80% reduction in carbon emissions from the electrical grid by the end of 2015 compared to 1990 levels, it resulted in a significant additional cost to Ontario’s economy. Failure to engage in proper analysis and simulation in policy development is akin to attempting to pilot a plane across an ocean without instruments or a plan—insisting that visual cues will suffice. Just because an individual can fuel a plane, sit in the pilot’s seat, turn the ignition, and take off does not guarantee a successful trip. Real challenges arise halfway through the flight when clouds roll in, it gets dark, and the situation changes. Here, a lack of planning, systems, and expertise lends itself to disastrous results, and the same could be true for Ontario’s capand-trade program if proper analysis and simulation are not undertaken. In closing, it is important to recognize that your government does not need to fly alone on its climate journey. Engineers hold a variety of senior management positions in government and across industry, and their expertise is underutilized by the province. Furthermore, Ontario is home to more than 250,000 engineering graduates, many of whom stand ready to help the government achieve its environmental goals at the lowest practical cost. At OSPE, we too stand as a willing partner in combatting climate change. We are an organization that understands how to mobilize and leverage Ontario’s engineering talent, and it is critical that your government realize the potential of these partnerships. For cap-and-trade, and the larger Climate Change Action Plan of which it is part, Ontario is running out of runway to get things right. The need to consult with engineers, have them conduct analysis and simulations, and participate in establishing a credible plan to combat climate change is of paramount importance to the continued prosperity of our province. Read original letter here at this link. Urban drainage design standards and flood plain management standards have evolved over several decades, reducing flood risks related to sewer back-up, and overland (pluvial) and riverine flooding in Ontario. The following figure illustrates how sanitary sewer systems were exposed to high inflow and infiltration risks from rooftops and foundation drains (weeping tiles), how properties were exposed to inflows from limited lot grading and overland design, or at a larger scale, from flood plain surface flooding risks. New subdivisions built post 1980's, have separated sanitary sewer systems with lower exposure to inflows and infiltration that surcharge older systems, major/minor drainage system design to keep overland flow on right of ways, away from buildings, or safely conveyed to valleys along easements. Flood risks exist across a range of spatial scales from large river flood plain to local infrastructure floor drain. Spatial analysis of overland flow paths has correlated the risk of surface flooding along flow paths and their spread with observed basement back-up flooding. The map below illustrates how overland flow paths extend beyond regulated valley limits onto development areas, and shows how clusters of sanitary sewer back-up often lie within the overland flow spread. Mapping and analysis above had been completed by CityFloodMap.Com. A detailed assessment of the analysis is available here.